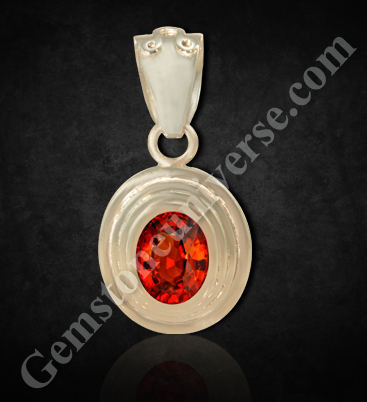 Comments The power of jyotish talismans is well known. Natural gemstones are an irreplaceable in the realm of jyotish solutions as planetary gem therapy relies completely on the power of gemstones. Featured today is a natural and treatment free Ceylon yellow sapphire of that has been set in 22-karat gold as a Jupiter talisman pendant. 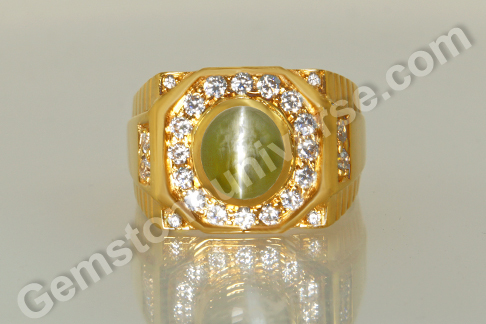 The oval shaped natural yellow sapphire of 1.95 carats has a lovely golden butter yellow color and has excellent clarity. In keeping with the reputation of Ceylon sapphires, it has extraordinary brilliance. Natural yellow sapphire or pukhraj is the gemstone of Jupiter/ Guru/ Brihaspati and is used to harness his saatvik energies. Jupiter’s blessings and grace are important for general well being and good fortune among other things. Ceylon yellow sapphires are regarded the best as they have the advantage of good clarity, color and lustre over gems from other origins. Yellow sapphire is a fancy sapphire – corundum colored yellow due to the presence of trace element iron. There are several shades to yellow sapphires ranging from pale to rich golden canary yellow. Comments Such is the color of the topaz, such is its allure, that the name given to it is Imperial Golden Yellow Topaz. The color of rich golden morning rays of Sun – nourishing and yet resplendent golden yellow is what seems to be contained in this gem. Featured today is a Imperial Golden Yellow topaz of 4.99 carats set in Sterling silver as a Jupiter Talisman ring. The fully natural and treatment free, imperial golden yellow topaz has a premium color with excellent clarity and matchless lustre. The gem is cushion cut and has a fantastic jyotish weight. Imperial Golden yellow topaz is the substitute gem for natural yellow sapphire or Pukhraj. 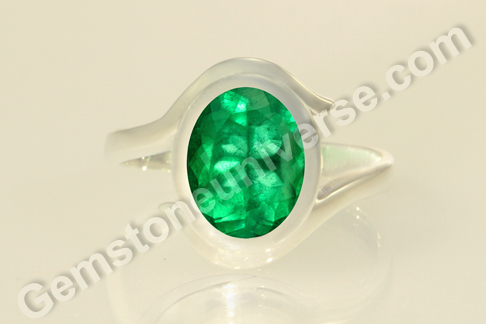 It is a gem of Jupiter also known as Guru/ Brihaspati, who is the mentor of the gods. Imperial Golden yellow topaz has a special place in gem therapy. 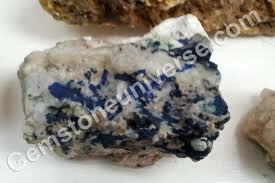 This gem is known to help an individual greatly in bettering his or her spiritual as well as physical strength. It can help an individual overcome lethargy and past conditioning and complexes and strategize for a brighter future with focus. The qualitative difference in life is palpable upon wearing this topaz. Imperial Golden yellow topaz is also believed to help in resolving metabolism related problems and eliminating toxins from the body in crystal therapy. Comments That which is clear and colorless, white appears so because it absorbs all colors of the spectrum. Indeed a powerful gem with the strong energies – those capable of bestowing one with all possible material possessions and pleasures. Featured today is a fantastic natural White Sapphire of 4.66 carats from the gem mines of Sri Lanka. 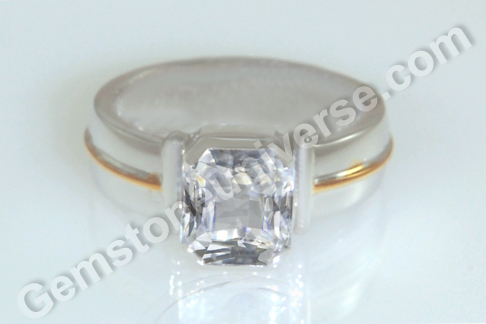 The emerald cut white sapphire has been set in white gold as a Venus talisman. The natural white sapphire is clear and colorless and has spectacular clarity and lustre. The ring shanks have a 22-karat gold line in the centre, creating a nice design statement. That having been stated, it should be mentioned that natural, colorless white sapphire is an extremely rare gemstone. It is colorless corundum. 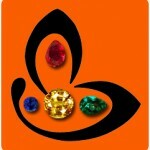 And with a fabulous jyotish weight of 4.66 carats, the gem is indeed a premium piece. In Vedic Astrology, natural white sapphire is the gemstone of Venus/ Shukra. It is also known as the safed pukhraj or naram vajramani. A well placed Venus in an individual’s birth chart has the potential of bestowing him or her with all the material pleasures and wealth. Here’s some interesting stuff – last year the Zafirro Iridium went on sale – what’s that? Well it is a $100,000 razor (limited edition of course). The Razor has blades made of LAB GROWN white sapphire! 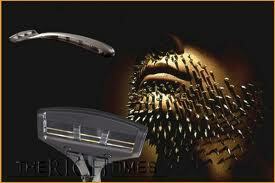 The blades are also supposedly atomically sharp, getting sharpened by “high-energy, ionized particles”. The blades are guaranteed for 10 years during which time the company will service and sharpen them, free. Hope that’s enough for an individual to appreciate the natural white sapphire, when he or she sees one! Comments There is a fest of the oh-so-rare happening or so it seems. Every time you look at a gem with the wonderment of a child, it just seems like a completely novel subject by itself. Featured today is a beautiful Indraneelam gemstone – a 3.49 carat rainbow blue natural Ceylon sapphire that is completely free from any treatment. The magnificent oval cut gem from Srilanka, is a resplendent violet-blue in color, that shows different shades of blue as light falls on it. 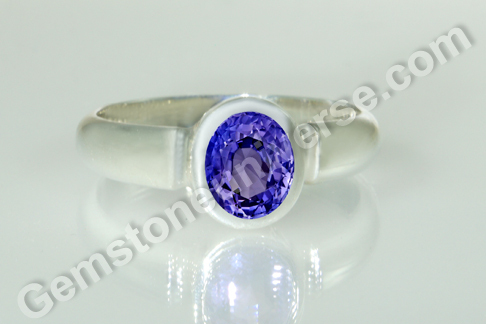 The gem has been set in Sterling silver as a Saturn Talisman ring. 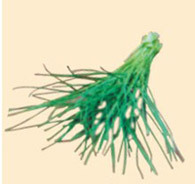 Indraneelam is a gem that has a blue tinged with violet in it, that gives it the rainbow blue color. It is simply fascinating – the sheer range of a single color that can exist in the world of gemstones and the vast comparisons that are made to index these shades! Yet, to the discerning and knowledgeable eye ‘It just knows when it sees it’! 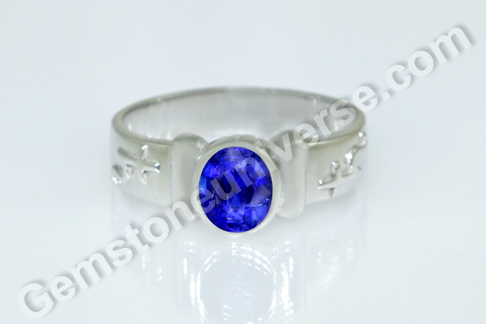 Blue Sapphire or neelam gemstone is the gem of Lord Saturn/ Shani and is used to harness his saatvik energies. Comments Pure, unadulterated energy, divine planetary energy – coursed through the myriad pathways over millions of years and condensed into colourful crystals inside the womb of the earth. Secretly, in faraway confines, it assumed form – something that could be available to humankind, only if it looked hard enough – true treasures that had the power to transform lives – the gemstones. 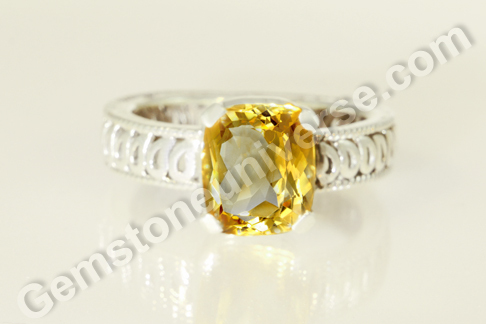 Featured today is a fine natural and unheated Ceylon yellow sapphire of 3.40 carats. This unheated yellow sapphire of carats has been set in 22-karat gold as a Jupiter talisman ring. 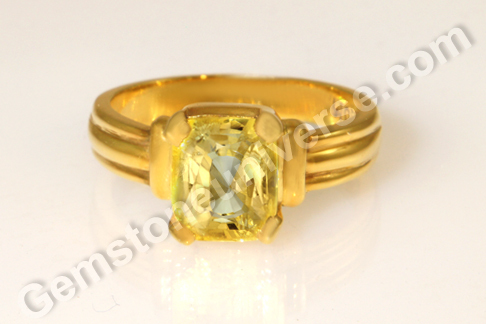 The cushion cut gem from Ratnapura mines of Srilanka has a gorgeous canary yellow color and fantastic clarity. Yellow sapphire or pukhraj stone is the gemstone of Jupiter/ Jove/ Guru/ Brihaspati and is used to harness this planets benevolent energies. 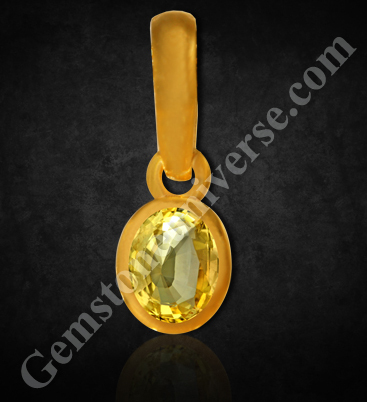 For best jyotish results, a natural and unheated yellow sapphire must be used in a talisman. A question often heard is who should wear a yellow sapphire. Does it bestow good fortune to one and all? The answer to this quandary is that, despite Jupiter being the Devguru and a benevolent planet it is always best to get a proper gemstone recommendation based on analysis of one’s birth chart. 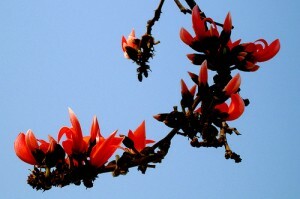 An unsuitable gem for an individual can bring about more problems that can be imagined. Comments Once in a while a gem comes along and you know that it’s something that may not come by any time soon again. That it is great fortune to be able to gaze upon it and hold it in your hand. Featured today is a Natural Burmese Blue Sapphire of 1.54 carats. This oval shaped gem has an intense color – deep royal blue, one look and you will be mesmerized by its beauty. Fully natural unheated blue sapphire, this one has great clarity, despite the saturation of color. 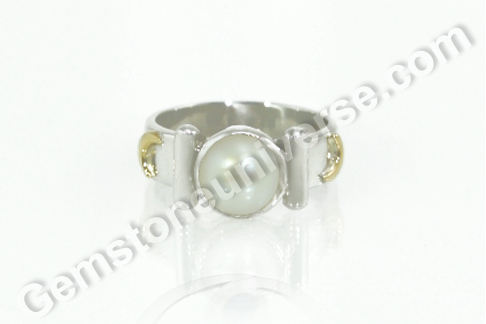 The ring has the symbol of Saturn standing in relief on the shanks. The land of golden pagodas – Burma or Myanmar as it is known, has been the land that has produced world’s most finest and coveted gemstones. It is another story that the blue sapphires from Burma were legendary at one time but the markets soon went dry. The rubies and sapphires (remember both are minerally the same , corundum) from Burma are toast of the gem world. So when you see a Burmese Blue sapphire, you know you have laid your hands on real bounty. Blue sapphire or neelam gemstone is the gem of Lord Saturn or Shaneeshwara and set into a talisman it is used to harness the saatvik energies of this planet. The transformative energies of Saturn can enable many positive qualitative changes in life of the wearer. The only cautionary note here is to have your birth chart analysed and get a proper gemstone recommendation before wearing the blue sapphire.